Hamas leader Ismail Haniyeh meets Egyptian officials, say the organization is willing to begin reconciliation talks with longtime rival. Hamas politburo chief Ismail Haniyeh said after meetings with senior Egyptian officials that the organization is willing to begin reconciliation talks to advance the establishment of a Palestinian unity government with Fatah, Haaretz reported on Monday. The two groups have been at odds since 2007, when Hamas violently took control of Gaza in a bloody coup, and all attempts to reconcile the sides have failed. A unity government between Hamas and Fatah collapsed in 2015 when Fatah leader and Palestinian Authority (PA) chairman Mahmoud Abbas decided to dissolve it amid a deepening rift between the sides. Prior to Haniyeh’s latest declaration, Hamas had demanded that Abbas halt a series of measures taken against Hamas before sitting down to discuss a reconciliation deal. 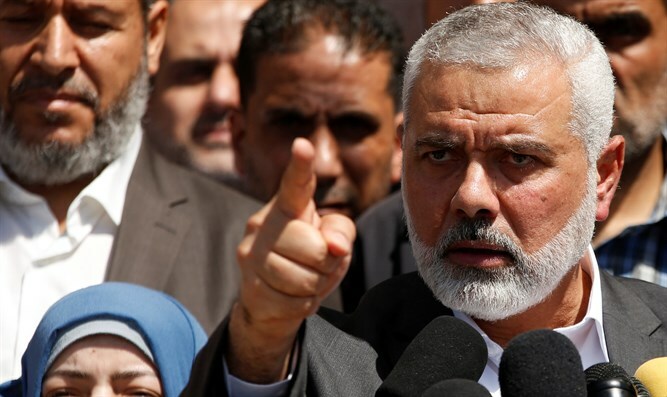 Haniyeh and a delegation of Hamas senior leadership left Gaza on Saturday for meetings in Cairo with Egyptian intelligence officials, including head of Egyptian intelligence general Khaled Fawzy. After talks with the head of Egyptian intelligence, Haniyeh said Hamas was willing to dismantle the administrative board tasked with running the day-to-day affairs in Gaza. Its management has escalated tensions between Hamas and the PA, which recently finally acknowledged that it has no control over Gaza and has been trying to force it to return control of the enclave by creating economic pressure on the group. Announcements such as Haniyeh’s have been made in the past, but rarely in the presence of Egyptian officials, noted Haaretz. This indicates this could be the beginning of a new era of reconciliation talks between the warring factions. In a terse statement issued after the talks in Egypt, Hamas announced that Haniyeh and members of his delegation would be talking to senior Egyptian officials about mutual relations and steps that Egypt might take to ease the blockade on Gaza. The steps would be based on understandings developed in recent months.